Renovo Boat Canvas Cleaner 500ml – For regular cleaning of boat covers, freshens appearance and helps preserve overall condition.Instructions: N.B It is advisable to test on an inconspicuous area first, to ensure canvas is colourfasted dyed. Never use pressure washers on boat covers.Dry brush the cover to remove any residual dirt.Dampen surface of cover with a mist spray of water of damp cloth.Shake well and pour into a suitable containerApply with a new 2″ paintbrush using even brush strokes. Start at the centre of the cover working out towards the edges.Leave for 10-20 minutes to ensure the cleaner can work on difficult grime and stains.Start scrubbing using hand hot water and a sponge, cloth or bristle brush until the cleaner begins to lather and dirt is being removed easily. Finish by rinsing off with water.Repeat the whole process if necessary.For heavily soiled surfaces leave the solution to dry for approx. 60 mins. 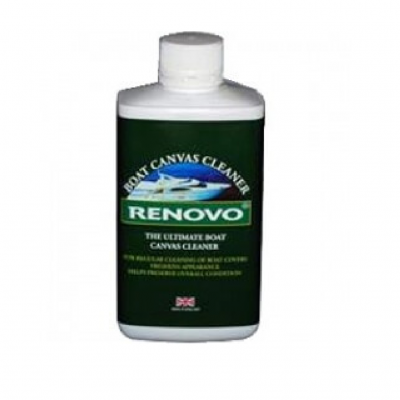 Heavily soiled surfaces should be scrubbed with hot water and a bristle brush.Bird droppings/difficult stains: Dab or pour the cleaner directly onto the spot of dirt or stain. 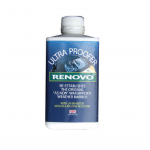 (massage into the affected area), clean off after 30 mins, repeat process if necessary.Light soiling/quick cleaning: For less soiled tops cleaning can start immediately, pour directly onto a cloth or sponge and massage into affected area, rinse off with water.Finally leave to dry before applying ‘renovo marine ultra proofer’. 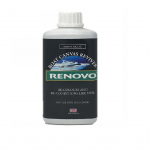 This marvellous formulation not only protects and conditions against stains and oxidationit also contains mould, mildew and UV inhibitors.MADE IN ENGLAND.